When you combine heart and soul, amazing things are bound to happen. 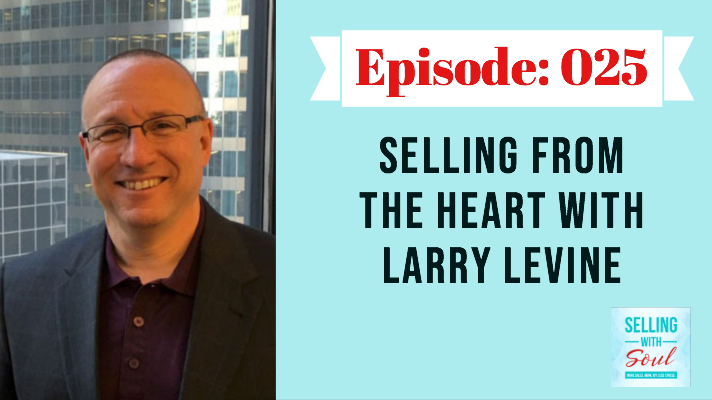 My guest on this episode is Larry Levine, author of Selling From the Heart... How Your Authentic Self Sells You and host of the Selling From the Heart podcast. Larry believes, like I do, that sales can be a noble profession. It doesn't have to be cheap tactics and empty promises. You can win AND the client can win but only if you stay authentic. This is a unique episode in that we discuss high level philosophies of sales like "servant-led selling" but also get down to ground level selling strategies that can help you align your goals with the prospect or client for sales that you can feel good about. Listen and subscribe to Larry's pod Selling From The Heart today! Are you an entrepreneur, small business owner or leader looking for more advanced, one-on-one help generating revenue? Click for more information about my Sales Intensive Coaching Program and let’s exceed your next revenue goal. 34:34 - What's keeping you from building partnerships in business? If you like what you hear, subscribe rate and review on Apple Podcasts, Stitcher or Google Play and share with a friend. Is there a particular topic, challenge or expert view that you would like to see featured here on the Selling With Soul podcast? Email me at Meredith@MeredithMessenger.com and be part of our show! Selling with Soul is part of the Sell or Die Podcast Network. Subscribe to these other amazing network podcasts! Newer Post26: Bite Sized Sales: What's YOUR Story??? Want help growing your Sales and Your business?